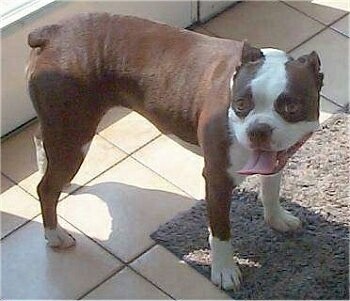 The Olde Boston Bulldogge is very affectionate and bonds well with the family. 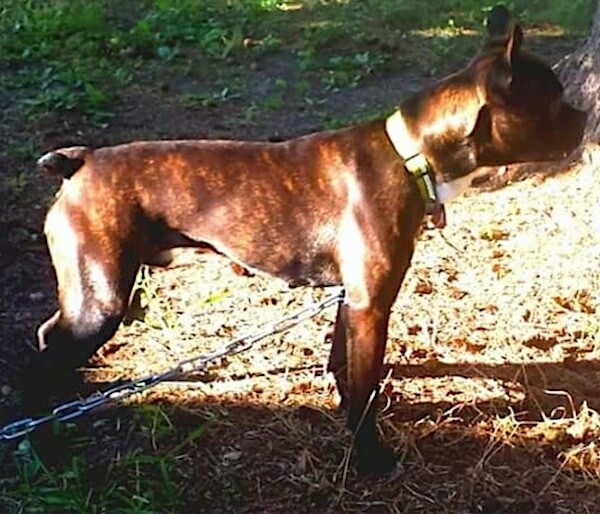 This working dog is easy to train and loves to please. He craves leadership and an understanding of what is expected of him. Owners should decide upon the rules of the house and stick to them. 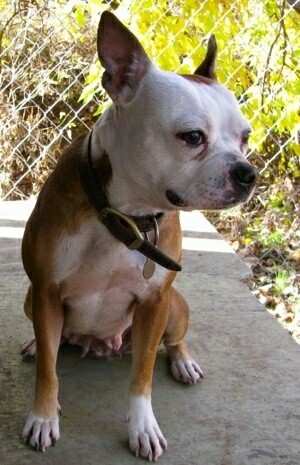 Olde Boston Bulldogges are good for apartment as well as country living. They are relatively inactive indoors and do okay without a yard. This breed is sensitive to weather extremes. 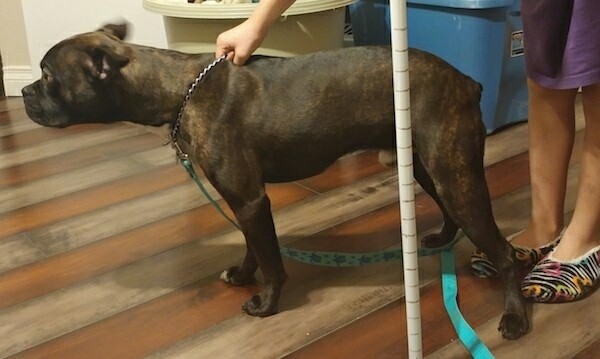 This breed needs to be taken on a long daily walk. The smooth, shorthaired coat is easy to groom. Comb and brush with a firm bristle brush and bathe only when necessary. Wipe the face with a damp cloth every day and clean the prominent eyes carefully. Check both the ears and eyes for grass seeds. Ticks may also lurk in the ears. The nails should be clipped from time to time. This breed is an average shedder. 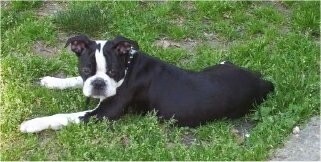 The Olde Boston Bulldogge is the original Boston Bull, the breed which the Boston Terrier developed from, therefore the early history of the Olde Boston Bulldogge is the same as for the Boston Terrier. 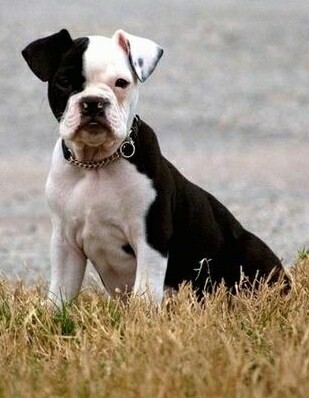 It is the original type and form of the breed once known as "The round-headed Bull and Terrier" of Boston, USA (the old type Boston Terrier). 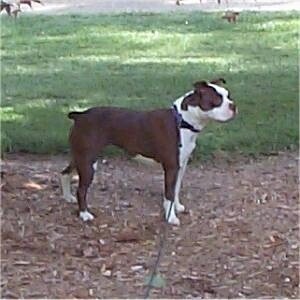 The Olde Boston Bulldogge is a separate breed from the Boston Terrier. 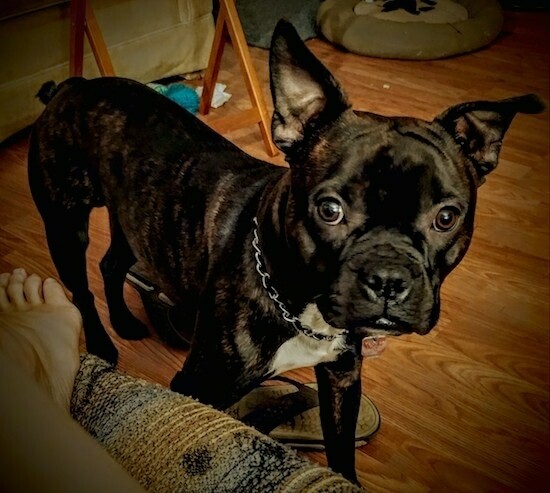 "This is Loki the one year old Olde Boston Bulldogge. He is from Rutan, FMR and O'klassic line's. He is super driven and so eager and willing to please! We get tons of compliments on his look and physique everywhere we go." 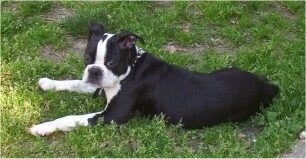 Loki the Olde Boston Bulldogge at 1 year old from Rutan, FMR and O'klassic line's. Meet Madison! "She is the talk of the town. 2 ½ years and a true round head. 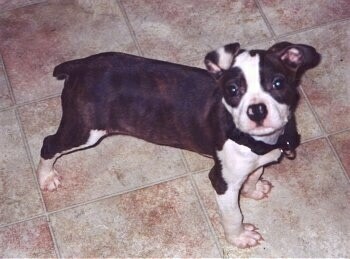 She comes from the original Boston Bulls prior to being bred down. She is a slim, well-muscled lady of 31 pounds (14 kg)." 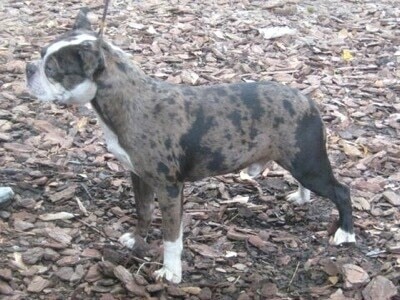 "This is a blue merle, male OBB named BigBully Kennel’s Rebel." 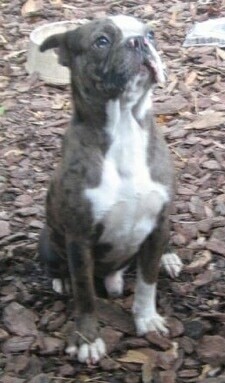 "Blue merle, male Olde Boston Bulldogge named BigBully Kennel’s Rebel." "This is Tonka, a 3.5-month-old Olde Boston Bulldogge puppy from BigBully Kennels."